Apple picking is one of those seasonal markers in New England. With four seasons to pack in over 12 months it’s easy to sometimes forget to participate in annual rituals such as filling a plastic sack with MacIntosh, Macoun, and Empire apples or picking out a perfect pumpkin. 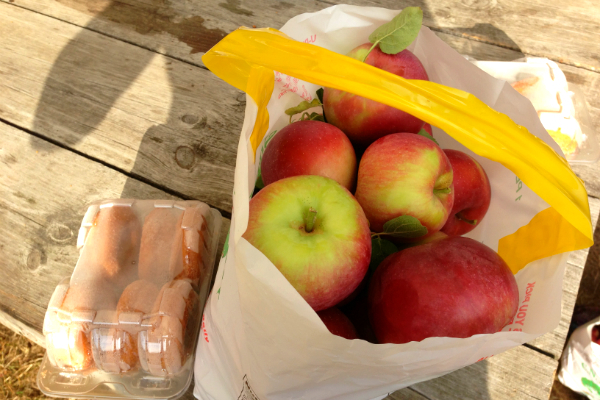 This weekend, some friends and I managed to squeeze in a visit to a local orchard to harvest the fruit and pick up some cider doughnuts. I wanted to give it a try. 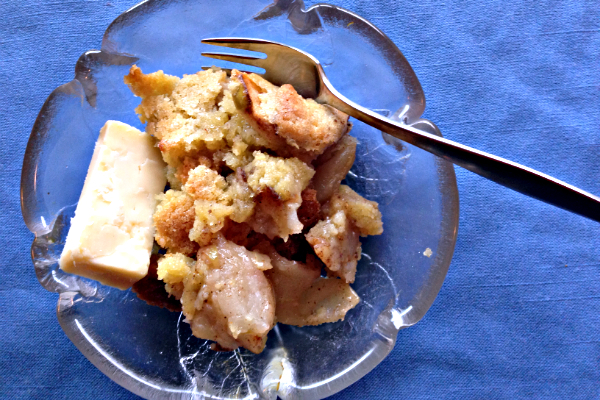 There is no bottom crust and the upper crust is just smoothed over the sliced apples like a cookie dough batter. Seemed easy enough! Traverso recommends any “firm-tart apple” like Granny Smith, Rome, Suncrisp for the pie filling so that the acidity stands up to the rich batter. But the orchard we visited this weekend just offered tender-tart varieties, so into the pan went a round of Macouns (can we really go wrong with apple pie? I don’t think so). Swedish apple pie is as easy as the recipe claims. And the crust is very much like a sweet, chewy cookie. 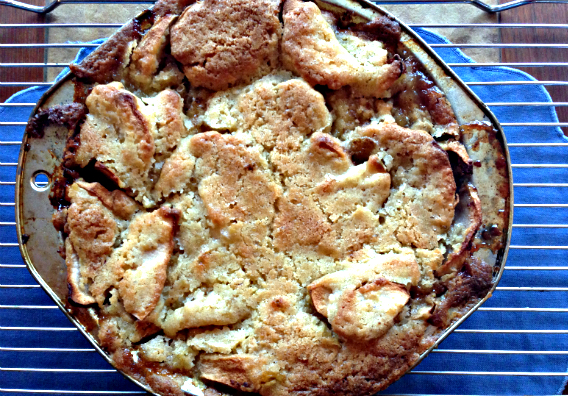 It’s a nice variation on an apple crisp although not as pretty as a pie with a lattice crust. 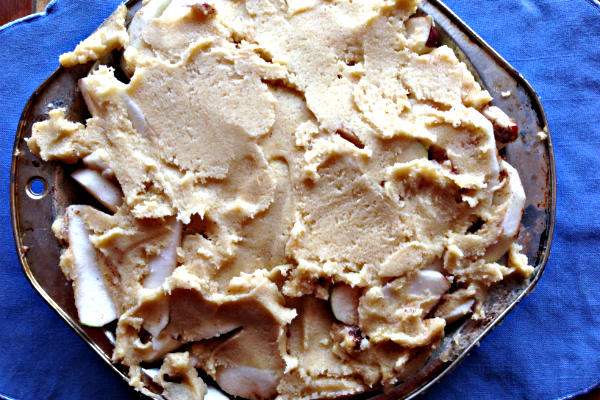 Start to finish, within an hour and half, after the pie rests a bit, you’ll be scooping up a warm apple dessert. Serve it with a slice of cheddar cheese, another New England tradition not to miss. 1. Preheat the oven to 375 degrees F. Grease a 9- or 10-inch pie plate and set aside. 2. 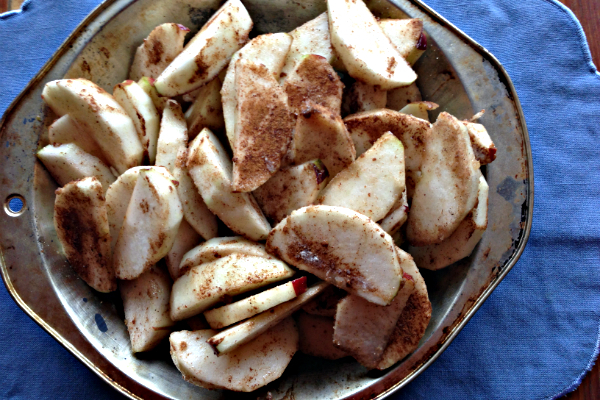 In a medium bowl toss the apple slices with the cinnamon, 1 tablespoon flour, and 2 tablespoons sugar. Stir to coat and arrange evenly in the pie pan (don’t worry if it looks quite full). 3. Using a mixer, combine 1 cup flour, 1 cup sugar, the butter and the egg. Mix until well combined and smooth over the top of the apples with a rubber spatula. 4. Bake until the crust is golden brown, about 40 to 45 minutes. Let cool on a wire rack for 30 minutes. Serve warm. I love this pie! I’ve got to try it. I’m completely intrigued by the crust!